Low German speaking Mennonites from Latin America who have recently arrived in Ontario are adjusting to major cultural shifts. Adapting to the large number of government and social services available takes a great amount of time and energy on their part. As service providers, you can help with their transition by being sensitive to this reality. Following are some suggestions and considerations pertaining to relating with clients from Low German speaking Mennonite colonies in Latin America. When Low German speaking Mennonites come to Southern Ontario from Latin America, they usually settle in communities where other family members and acquaintances have already established themselves. As the Low German communities grow, so too do a wide variety of supportive programs. MCC Ontario provides settlement and family support services in Leamington and Chatham-Kent. Mennonite Community Services (MCS) provides settlement, employment, and family services in Aylmer. The following provide programming particular to the Low German population: Woolwich Community Services, Woolwich Community Health Services Norfolk Community Help Center Drayton Newcomer Program (Wellington County) Poole ESL Program (Perth County). Often times, Low German Mennonite parents are uncomfortable with ministry funded schools and will opt to educate their children in parochial or homeschooling systems. Many Low German Mennonite families reside in rural areas. Therefore, even if they are made aware of resources, they will often struggle to access them. Because of low literacy levels, it is important to provide resource information both orally and pictorially, when possible. Due to financial constraints, especially upon initial entry to Canada, adults (women in particular) do not obtain driver’s licenses and other typical documentation that is helpful to the settlement and employment process. Coming to Ontario from a largely self-sufficient agrarian context where an important value continues to be that families work together on the farm for family sustainability, one of the first major challenges for these families is understanding the different values in Canadian culture. These differences are most evident regarding education, paid employment outside of the family context, and the role of children in/for families. This clash of cultural values may be expressed in responses such as: “Why would I go to school when I can help my family have a better life?” or “If you live under my roof, you will help the family”. Adjustments to government involvement: Colony Mennonites encounter a Canadian society that is highly regulated and monitored. Everything from driving to health care to education and how to discipline children is regulated. This level of regulation is something they are not accustomed to. Learning about, understanding and adapting to these new regulations takes time. In Old Colony communities in Latin America, social issues such as poverty, abuse, conflict, alcoholism and youth troubles are issues to be dealt with by the church whereas in Canada these are often the responsibility of the state. Thus Low German Mennonites can be surprised when government agencies become involved in these issues. While new to them, Low German individuals have stated that they appreciate Canada’s social framework. Are you speaking from experience? When giving advice, you may find Low German individuals will want to know if you are speaking from personal experience or from “textbook knowledge”. Advice and other information will often be better taken if you can express that you have personal experience regarding the issue. 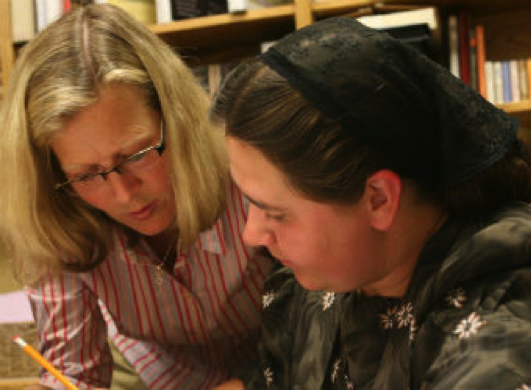 Asking for signatures: Because of their oral culture, Low German Mennonites are sometimes confused about the purpose or importance of signatures. You may encounter individuals who are reluctant to sign any document or conversely, are willing to sign any document that you put before them. Families may be aware of situations that have resulted in harm due to people signing documents while not understanding what they were signing or the implications of the signature. Naturally, this increases their uncertainty. Some individuals may print their name when asked for their signature. This may be because they think it is neater or can be read more easily and that this is a requirement for signatures. Reasons for initial transiency: Upon arrival in Ontario, families may initially be very transient because they are searching for year-round employment, for housing that has lower rent and heating costs, and/or for homes located in rural areas. Connecting to other Low German families in their community: If Low German families are not already connected by family ties when they come to Ontario from Latin America, they may not be aware of other Low German families living down the road. When they do encounter other Low German Mennonites in their communities, they may not necessarily initiate contact with one another due to a general sense of timidity that many feel. Cultural shifts: Resettlement in Canada always results in some degree of cultural shift, but the evidence of this shift is largely determined by the cultural starting point that each family begins the resettlement process at. Looking at our own value systems: Service providers may expect Low German families to adapt to Canadian culture in very particular ways, especially when it is noted that some families do/can take on mainstream cultural values. Our expectations for their change is rooted in our own value system and when we are faced with families who choose not to live according to our values (i.e., continue to wear traditional clothing, have large families, not pursue post-secondary education) it is important that we do not take offence to their choice to live within a value system that is different from our own. Value systems change within culture and over time (our own included) and therefore should not be used as barometers of right and wrong, good and bad, or healthy and unhealthy. Academic research: Many Low German Mennonites do not understand the interest that their alternative ways of being generates and are therefore confused when people want to conduct research on/in their communities. As service providers, we feel we benefit from research because it guides our practice. Low German Mennonites do not understand how or what this means because, for them, tradition guides their practice. Life is taken at face value and the meaning making that coincides with research does not often translate to practical realities for them. It is partly for this reason that academic research regarding Low German Mennonites is limited. Also, Low German communities are often hesitant to agree to participate in research because they are particularly concerned about the perpetuation of stereotypes and of being misrepresented in mainstream society; it sometimes seems better to say nothing at all than to be misunderstood.